A lot of people worry about any number of ways their lives might be snuffed out, in this scary new world. Hordes of murderous immigrants pouring across our borders, nuclear war, super-resistant strains of bacteria, and the accelerating pace of climate change all occupy their thoughts. Yet, while many fret, others have made a plan. Whatever the holocaust may be, these folks are determined to survive. And they will do so, not by fleeing to the mountains with bottled water, dried food packets, assault rifles and an American flag, but in the manner they have been accustomed to: wearing their designer duds, having their manicures, checking their portfolios, and hiring nannies. Thanks to Larry Hall, these folks can continue their privileged lifestyle in safety and comfort, while mayhem, in one form or another, obliterates the rest of us. 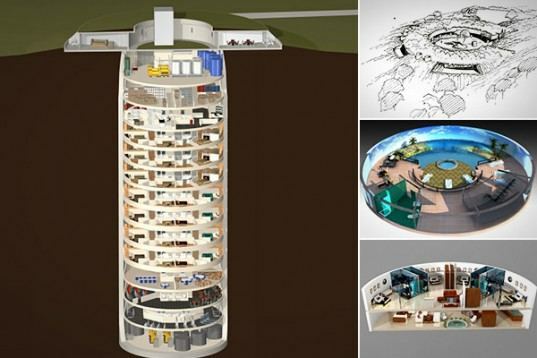 Hall, the CEO, CEO of the Survival Condo Project, turned a decommissioned, 15-story nuclear warhead silo in a desert area in the middle of Kansas, into an underground fortress. The condo, which looks like a large garbage disposal, sold off individual units to America's rich and famous and scared. For a mere $1.5-$3M ($4.5M for the penthouse model), one can have a unit with exterior walls 2.5-9 ft thick, indoor shooting range, hydroponic food, indoor pool, dog park, arcade, classroom, library, movie theater, digital weather station, more. Residents can also set their "windows" to any location they like. So you can live in the heart of Manhattan, while your next door neighbor lives in the south of France or the Swiss Alps. No matter which location you choose, the sun rises and sets each day, and weather patterns continue as expected, for that particular location. Residents who prefer to believe they live in a space shuttle, hurtling across the globe, can choose to change the locations on their screens as quickly as they change TV channels. And there's more. The website proclaims "In addition to living quarters and building amenities, the condo 'package' includes mandatory training, a five-year per person food supply, fully furnished and custom designed interior, special equipment for registered members, computer access to condo systems, and much more. Only a portion of the total fee is for the actual Survival Condo Unit." There was no further explanation of "mandatory training." Life in the Boomer Lane can't imagine what kind of special training would be necessary, given that once people are inside, they would be safe from attack of any kind, aside from surly condo employees. On the other hand, a five-year per person food supply might incite riots if people needed to stay inside longer than five years, or if people chose to eat more than their allotment of daily food. Hall was asked how people would get to the condos, assuming the worst was going on outside. "Oh, we don't have to worry about that," he said. "These people have already made their own arrangements." Alert readers may now be asking who "these people" are. One is an executive of a tobacco product firm, who paid $12M in cash for four units. Tyler Allen, a Florida nightclub owner bought in as well. Silicon Valley billionaires have bought in, as well, along with buying their own islands and building luxury bunkers made only for them. It makes sense. Why would one want to wait in line for an available target practice slot? Those selfish people aside, Hall says all of his units have been sold out, and he is looking for other nuclear warhead silos to buy. Hall hasn't explained exactly who will give the signal that events have reached a point at which owners can head for the condos. One can assume that they will be pretty pissed off if they all rush toward Kansas and it turns out to be a false alarm. He also hasn't explained why food supplies last for only five years. LBL assumes this is because at the end of five years, residents expect to exit the silo and be greeted with the fully-functioning world they are used to, complete with Oscar de la Renta, Harry Winston, $666 Douche Burgers, and a $50,000 per year preschool, in which two-year-olds have to pass an interview to be accepted.